Choose Healthy Here retailers have hung posters and signs within the store to draw attention to healthy products. Lincoln, Neb. — Nebraska Extension has partnered with local agencies to make healthier options more accessible in communities throughout the state. 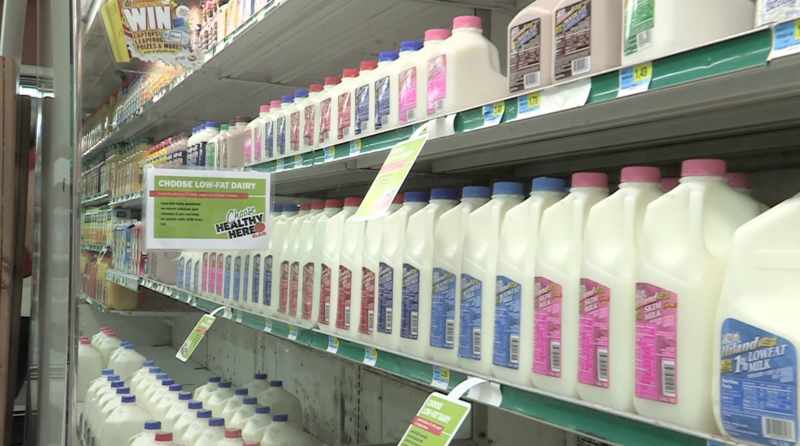 Twenty retailers across Nebraska are participating in the Choose Healthy Here program to increase access to affordable, nutritious and safe foods. The 2015 Nutrition Environment Measures Survey indicated that among 772 stores across 30 counties measured, only 18.5 percent of stores stock adequate access to all five healthy food groups. Using this data, Extension targeted retailers that have less than adequate stock of healthier food and those that reside in locally identified areas of need to participate in the program. The program works with community partners to help retailers expand their product offerings to stock healthier items such as low-fat yogurt, whole wheat pasta, non-fat milk, along with fresh and frozen fruits and vegetables. Once the products are available, Choose Healthy Here programming is delivered to the community through store promotion and marketing, community outreach and nutrition education, youth-oriented activities, store support, and in-store activities. Program retailers have hung posters and signs within the store to draw attention to healthy products, held youth healthy recipe competitions and implemented in-store taste tests featuring the healthy products. To strengthen customer loyalty, some retailers have hung posters in the store asking customers what healthy items they would like to buy at the store. “Choose Healthy Here is a great program because we’re available to go to the local level to work with the grocery stores and help local families make smart and healthy purchasing decisions,” said Kathy Kneifl, a SNAP-Ed extension assistant in Dodge, Saunders and Washington Counties. Members of the Choose Healthy Here program team recently presented on Choose Healthy Here at the Public Health Association of Nebraska’s Public Health 150 conference. The conference focused on opportunities for innovation, advocacy and action on public health in Nebraska. Choose Healthy Here program partners include the Nebraska Department of Health and Human Services and SNAP-Ed. For more information about Choose Healthy Here, contact Wielenga at 402-472-0361 or vwielenga2@unl.edu.